The Monarch Hypodown Down Comforters - 800 Fill has been discontinued. The Monarch's long staple Egyptian cotton cover and fluffy fill makes it the perfect choice for a sumptuous yet affordable night's sleep. These comforters are edged with satin piping and stitched with a simple yet elegant 12 inch square baffled box design. The comforters are filled with 700 fill Hypodown - a clean blend of 80% pure Hungarian goose down and 20% syriaca clusters (the soft hollow fibers of the milkweed plant). The resulting blend of fill wicks moisture away from your body far more quickly than either down or synthetics. It is light and fluffy to encourage circulation and makes a very cozy comforter. These value priced Hypodown hypo-allergenic Hungarian goose down comforters are covered with a 300 thread count 100% long staple cotton with a sateen weave. Thread count refers to the number of threads per inch of a fabric. A higher count offers a smoother and silkier fabric feel and also provides a stronger barrier to prevent fill from escaping the comforter. The Monarch Hypodown 800 Fill comforters feature 80% Pure Hungarian Goose Down and 20% Syriaca Clusters. The 80% of down in the 800 fill comforter contains 95% large plumule down clusters and 5% of down plumule pieces. The down and syriaca in these comforters is the cleanest, least treated fibers we could find anywhere.The down is de-dusted and gently washed up to 8 times in an environmentally friendly cleansing solution and rinsed three times. This cleaning process and renders the down pH neutral. 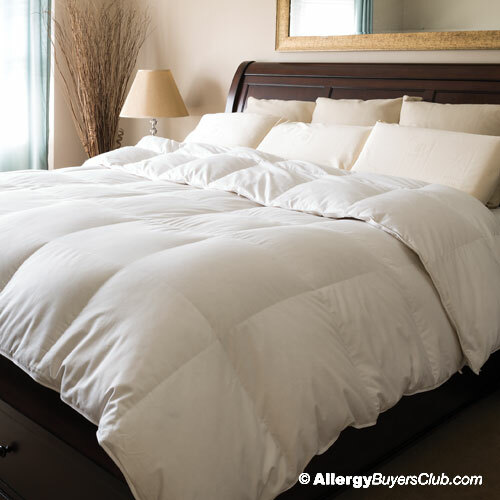 These are the most hypoallergenic down comforters we could find - due to the quality of materials used, cleaning process and the addition of the natural syriaca clusters.